Nexway helps companies achieve greater digital sales success through a simplified payment by quote to order system for digital products and online services. Blizz is an online meeting and collaboration tool from TeamViewer that gathers people instantly in an enjoyable, powerful and collaborative space. The key challenge was how to make these offers accessible in the seamless experience conditions as the Blizz tool itself. As digital commerce solutions provider, we offered the right elements and ecosystem for TeamViewer’s online conversion and digital monetization needs and desire to scale the distribution of their new product. 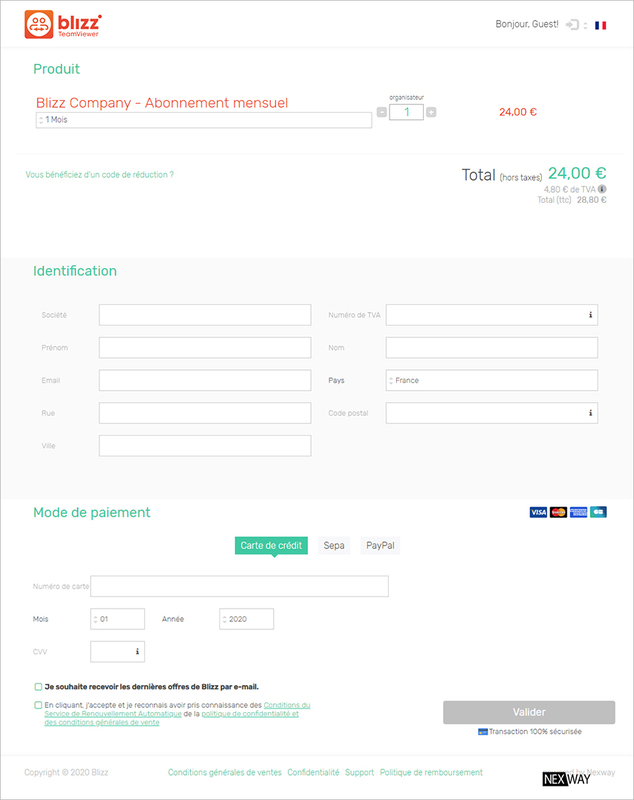 As other readily available online payment methods (eg. Credit Cards, Paypal), quote requests needed to be handled in high volumes and maintain a seamless purchasing experience. We provided a Quoting system that catered to these conditions allowing the production and distribution of sales quotes to customers. In addition, Nexway’s automated payment, invoicing and subscription systems completed the customer workflow once the quote accepted by the customer. 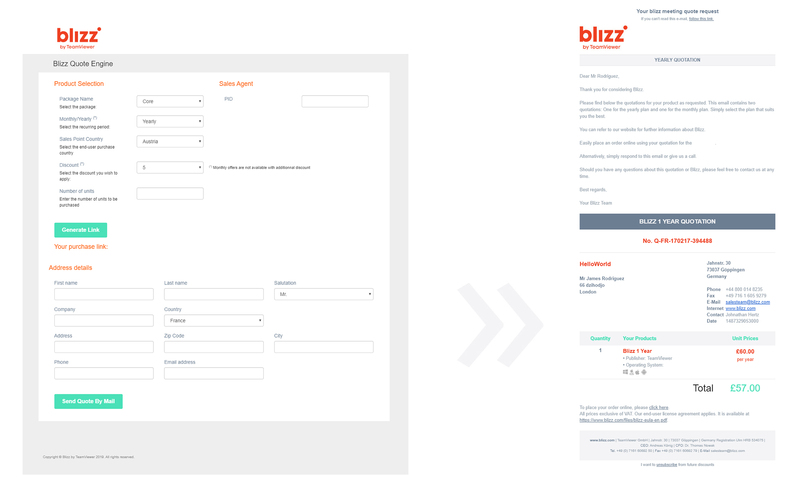 Blizz required a global solution that could replace their current quoting process, improve customer engagement and visibility of internal metrics. Our quote-to-order system allowed Blizz’s sales team to generate quotes easily and quickly and send them to potential customers. a quote engine at the disposal of Blizz’s sales agents. 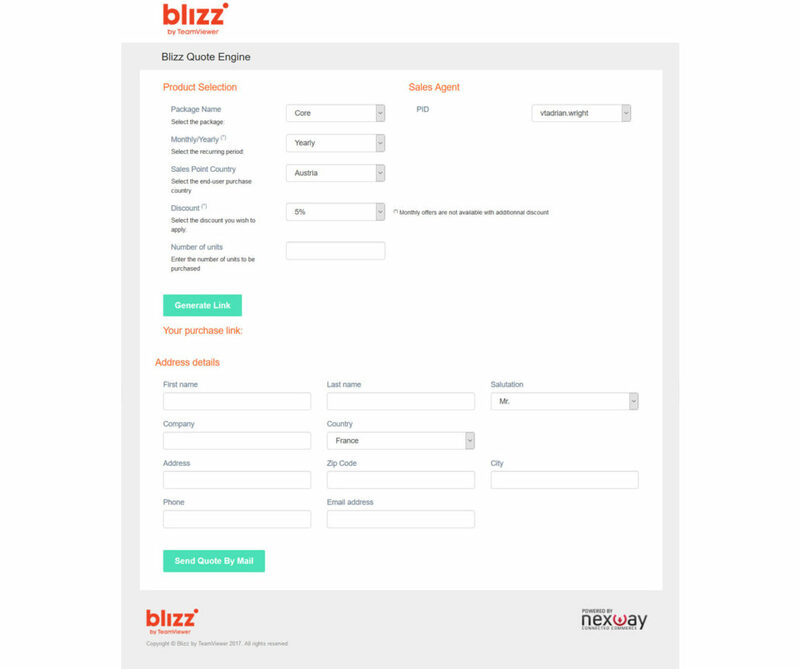 Our automated quoting tools used by Blizz allow end-user to complete a quote request online and receive an estimate instantly. This quote includes 2 options: a monthly quote and an annual estimate. There is also the possibility of contacting an agent (phone number), this agent has the option to offer discounts. We also provide to Blizz’s team a branded quoting system for their sales agents to select the proper formula for each prospect. Our solution ensures consistent pricing and discounting, building customer-friendly quotes easily and accurately. Depending on the prospect’s needs, the agent proposes the Blizz package (Core, Crew or Company) that best matches the request and sends a quote to prospects that can be eventually discounted. Reduced customer wait times and thus improving customer satisfaction. Multi device quoting interface for potential Blizz’s customers and sales agents thanks to optimized responsive design. Qualified customers data for retargeting in case of non-conversion. Single reporting interface with segmentation based on quote generation source: sales agents /online. 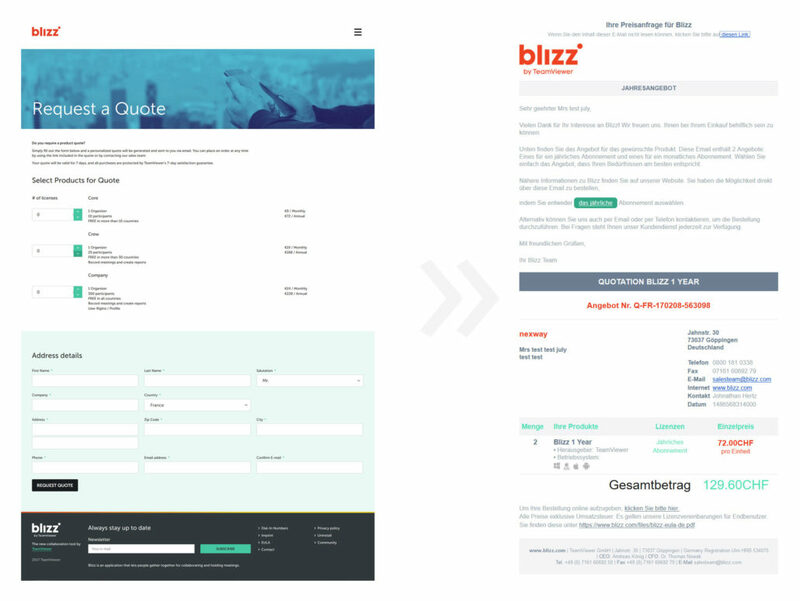 Interested in delivering sales quotes, contracts, and invoices to improve and increase velocity of your B2B conversion rates?